Cycle from Lake Reschen to Verona on this self-guided holiday in Italy’s Southern Alps. Following the Adige Cycle Path, you will ride the beautiful bike paths along the Adige River, passing impressive mountains and medieval towns. After a short ascent (Passo San Giovanni), you will descend the 500m to Lake Garda. From here, a boat will take you down the entire length of the lake before you ride through the vine covered hills to the beautiful city of Verona. 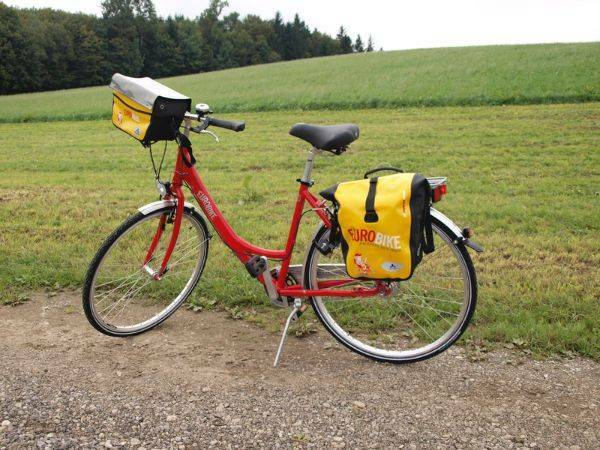 You will travel on beautiful bike paths mainly along the Adige River. 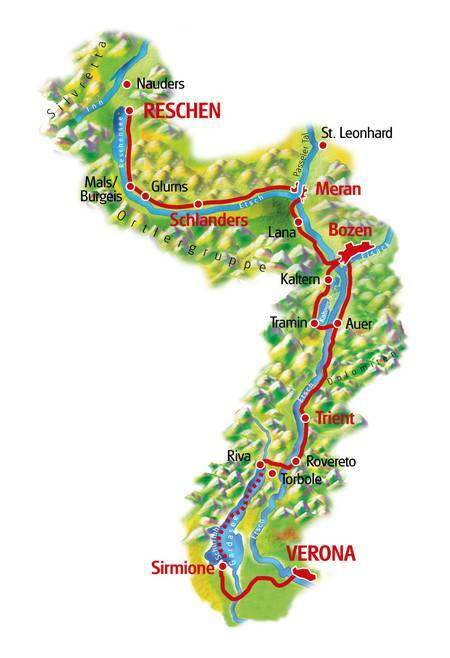 The route will lead you from Reschenpass (mountain pass) almost 1,500 metres in altitude downhill to Lake Garda. However, you will have to cycle some small climbs too. Overall, you will find yourself on beautiful bike ways and asphalted country roads. Unfortunately, moderate traffic is unavoidable on some short connecting roads. 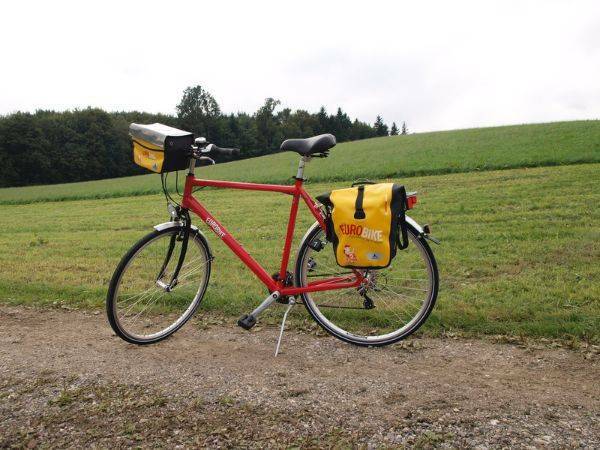 Reschen – Schlanders 45 km From Lake Reschen there are a few hills to cycle up, afterwards it is mainly downhill. Schlanders - Merano 40 km The route is mainly downhill (300m drop in altitude). You can shorten this stage to suit your own needs, by utilising the Vinschgaubahn (light railway). Merano – Bolzano 30-45 km After the 8.3km point you can also follow the cycle path towards Bolzano along river Etsch/Adige (the landscape is more beautiful on the described route). Between the 27 and the 35km points the route description doesn‘t match with the map, please follow the signs on the official cycle path. Bolzano – Trento 70 km Exclusively on cycle paths to Trento. Mostly flat route. Trento – Lake Garda South 50 km Almost always cycling on cycle paths to Riva del Garda. There is an ascent of approx. 100m altitude difference in Mori, afterwards a long descent follows to the Lake Garda..
We recommend starting latest by 9am in Trento. Boat departure time in Riva del Garda is approx.. 3pm and takes approx. 4 hours. Please present your voucher for the boat tour at the ticket counter (directly at the jetty) to obtain tickets. Lake Garda South - Verona 50 km Cycling through slightly undulating and very pretty scenery. Cycling on light traffic back roads. 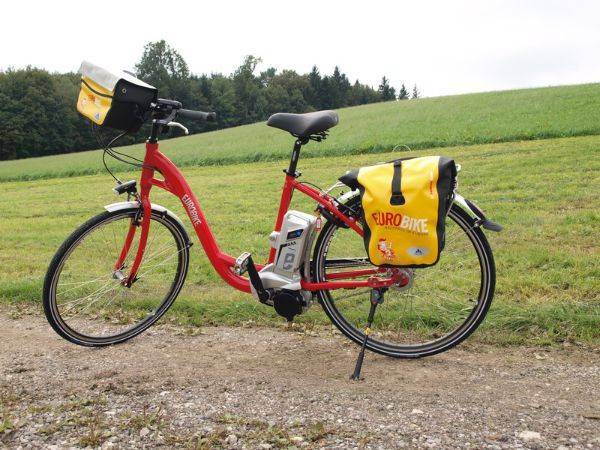 We recommend flying to Innsbruck or Verona airport to reach the starting point of this cycling holiday. By train you can travel to Landeck (North Tyrol) or to Bolzano and Merano (South Tyrol) and onwards via public bus. Mals train station is approx. 15km from the hotel, you can travel from here by bus or taxi to the hotel. Landeck train station is approx. 50km from the hotel, you can travel by bus or taxi to the hotel. Bolzano Airport – approx. 80km. From here, please see arrival by train. Innsbruck Airport – approx. 110km. From here, please see arrival by train. 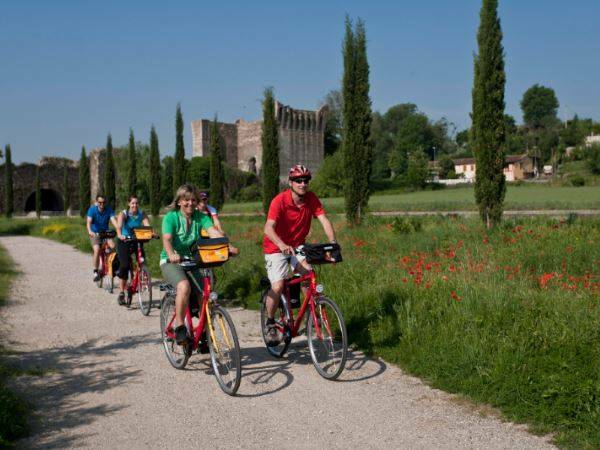 The Lake Reschen to Verona cycling holiday includes the daily transfer of luggage to the next hotel and local support if required.